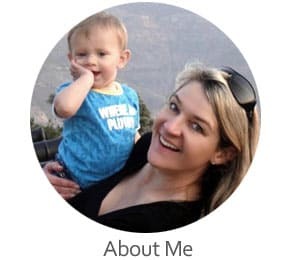 If you’re new to the trundle revolution, we’ll quickly catch you up. Firstly, welcome, and if you thought it wasn’t possible to get excited over a piece of furniture, think again. What is a trundle bed exactly? Simply, it’s a bed with a roll out drawer underneath, used to hold a mattress or for storage. Why it took so long to conveniently make use of dead space under a bed, is a mystery. Trundle beds are doing for the home, what the microwave did for the kitchen. This functional favorite is changing the game. No more linen cupboards filled with mothball smelling blankets, and no more hauling ancient mattresses from the shed. The list of things we love are endless, but first and foremost, this clever creation just makes life so much easier. Its space smart, storage savvy and a breeze to set up. Having guests over just became a lot more fun. Not to mention cool and stylish! And… there are so many options to choose from. Time for some trundle education! You’re about to find out all you need to know before inviting one of these babies into your home. After reviewing more than 20 different designs, these are our very best Trundle Bed winners for each class! In this category, our winner is the DHP Manila. It’s no fuss, elegant, and suites decor styles from clean contemporary to ornate Victorian. It’s affordable, durable and has an impressive weight capacity of 400 pounds that should withstand not just larger guests, but several excitable children. The trundle handles half that weight, so assign lighter guests to the roll out mattress. The daybed trundle wins the prize for most versatile. Its sofa like backrest makes it equally at home in a bedroom, family room, patio or study. When guests arrive, just roll out and get comfy. It’s available in bronze and dusty pink if you prefer, as well as a larger, full size option, offering you an additional 14,5 inches of sleeping space to accommodate 2 people up top, and another down below. See all our trundle daybed reviews. As a twin bed with trundle, the Coaster Home Furnishings is out favorite. 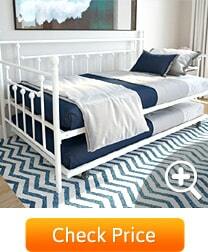 Available in black and white, this bed will not date. As kids grow and their room decor changes from Paw Patrol to glitter or Camo, this sturdy wooden trundle bed will follow their journey. It will even suit a college dorm room when the time arrives. This piece ticks all the boxes, and then some. The trundle stows away a comfy twin mattress, plus it has storage drawers to stash all those extra goodies. It is well made, good looking and will be well used in any family home. 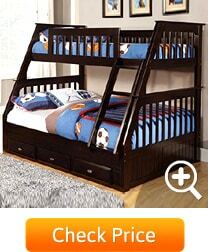 As with all the beds in this selection, it will need some basic assembling and does not include mattresses. See all our twin bed with trundle reviews. When it comes to the category of bunks beds with trundles, we truly love the Discovery World Furniture bunk. You’ll be spending a bit more on this bunk trundle compared to the above two beds, but with good reason. You get so much more bed and so much more value. This bunk doesn’t just offer you additional sleeping space on the upper level and in the stowaway trundle draw, the lower level accommodates a full mattress, comfortably sleeping two. This is multi-functional furniture at its best. Its sleeping capacity just opened up a collection of solutions. Kids sharing a room, check. Sleepovers, check. Grandparents visiting, check. More available floor space, check. The solid wood mahogany finish looks beautiful. The interchangeable ladder makes placing the bed in its best spot convenient, and the larger bottom bunk creates seating, where with conventional bunks, expect to bump your head. This is a high quality piece of furniture that kids will love to clamber on and eventually, fall asleep on. Comfortably sleeping 4, it’s the ideal bed for when larger family congregate over the holidays. See all our bunk bed with trundle reviews. Types of Trundle Beds – How to Choose! 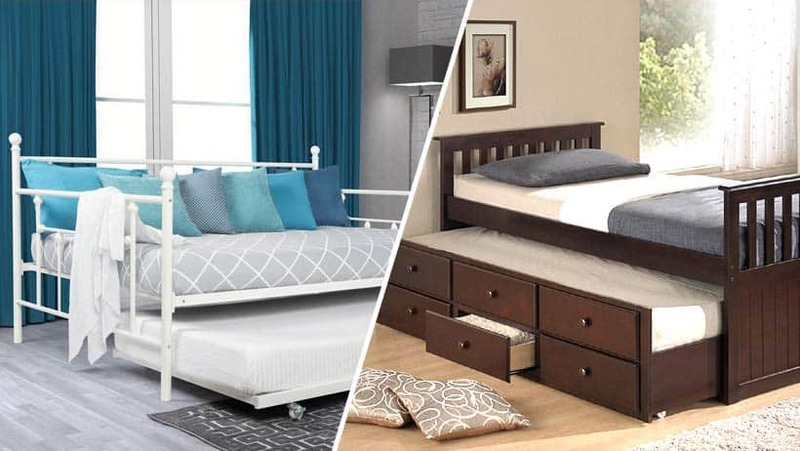 Trundle beds have experienced a massive surge in popularity in recent years, and it’s no surprise that this multi-functional piece of furniture is making its way into so many homes. From modern apartments to kids’ rooms and stylish guest areas, why not get the maximum use out of your space, while having it look magazine worthy. What trundle bed you select, depends on how you plan to use it. We’ve put together some stunning ideas for a variety of settings in the home. These gorgeous and compact pieces of furniture are ideal space-saving solutions for apartments, bedrooms and rooms that serve more than one purpose, like a study/guest room. Here are some tips to help you pick the best fit for your home without compromising on comfort and style. In this category, a daybed option is an obvious choice. The appeal of a daybed over a standard sofa is the luxury of having an over-sized couch and the added sleeping space when you have overnight visitors. The seating area is 38 x 75 inches of “lay back and relax” comfort. For a daybed that is an attractive centerpiece for a lounge or TV room, our recommendation is an upholstered daybed for its softer and more sophisticated look. If you prefer a metal or wood daybed, it is important to cover the backrest with a collection of plump pillows to make it more comfortable. Just don’t overdo it, you don’t want to make the daybed feel cluttered. Pick out an assortment of cushion sizes and colors that tie in with the decor of the room. In this setting, a backless daybed is our firm favorite. This type of daybed can float in a room and does not have to be positioned against a wall. The style is mostly upholstered with leather or fabric. A backless daybed is an ideal option for larger spaces like living rooms or lofts if you want to create an end to a seating area, without visually blocking off the space. Plus, it stores whatever you need in the neat roll-away draw. Add comfort to the open-backed daybed with side bolsters and pillows. If you want to add softness to the seating area, a throw can be wrapped around the middle of the daybed mattress with the ends tucked in. Alternatively, simply drape a throw over one of the armrests to make it more welcoming. The best fit for a kids bedroom is a wooden trundle bed and if you have to accommodate more than one child, double up and go bunk. We’ve chosen wood for its durability and in most cases, increased weight capacity. With the limitless energy of most children, it is wise to invest in a sturdy bed that can handle jumping and those extra knocks and bumps. Kids come with so much stuff, so storage is a big attraction. 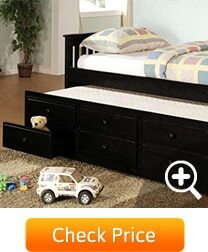 There are also various trundle beds that offer additional storage drawers in the trundle area which is great to keep a child’s room looking a bit more organized. Did someone say sleepovers? By this stage, we hope that air mattress and pump are long gone. This is the ideal solution for kids and tweens entering the sleepover stage of their social life. The trundle can easily be made up for guests. Simply roll it out, add pillows and blankets, and you’re set. Couch by day, bed by night. In this setting, all trundle beds types and finishes can work perfectly. It all depends on your individual needs. 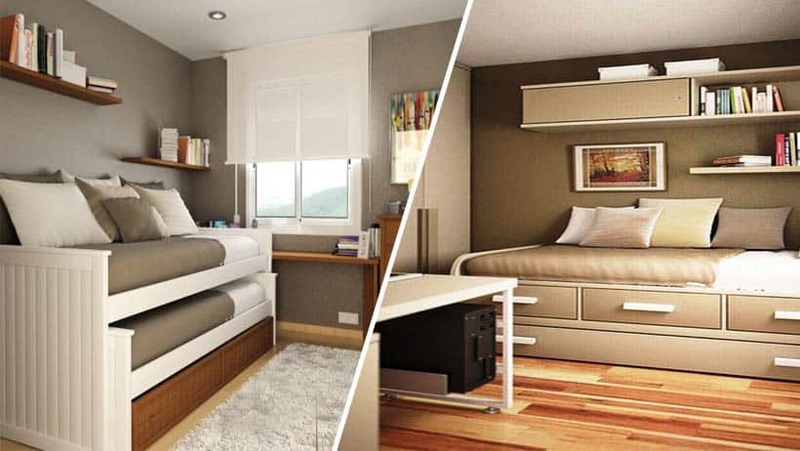 Dorm rooms can be cramped, so choose the option with the most storage and sleeping space, even bunk beds can work if you’re sharing, and if you need to replace bed space with study space. Studio apartments are generally also small, but bunk beds got quite match the “cool factor”. A daybed or twin trundle is the ideal bed and seating. 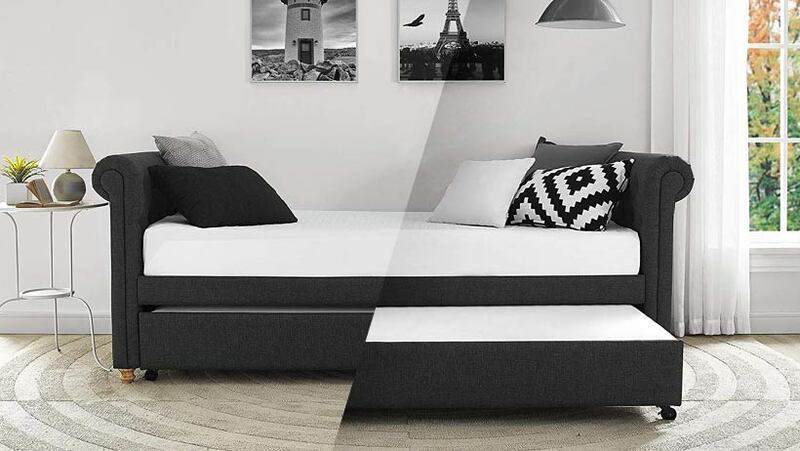 A fitted mattress cover is the ideal “life hack” for transitioning between day and night. Pillows and blankets can be stored in the trundle or tucked away under the mattress cover. Avoid using a bunch of loose bedding and sheets. Place the bed pillows at the back and build up the smaller, more decorative pillows to the front. This way, you create a polished ”boutique hotel” style. If you have a warm, cozy room that’s screaming for a sofa, then go daybed. Depending on your personal preference, a wooden, metal or upholstered trundle could be the perfect match. Should the area get a lot of sun exposure, then choose a finish that will not fade. With wood, be sure to treat it from time to time to ensure it doesn’t crack. Pillow selection is key for comfort, you want to have a combination of firm and soft pillows. Firm pillows are good for propping yourself up while studying or reading, and soft bed pillows are great for napping. Down-filled pillows are generally softer, so we’d recommend these for the latter. Have a side table within reach, to put down a book or a cup of tea. Again, the daybed is the winner because of its backrest. A daybed converts a sunny patio into the ultimate relaxation spot. Both metal and wooden trundle sofa’s work for an outdoor patio and are easy to wipe down when dusty. A waterproof mattress cover is a worthwhile investment to avoid water or sun damage. The trundle can be used for kids or pets who love to stay close and play. A patio retreat is an excellent spot for curling up with a great book or taking that after-lunch Sunday nap. If you’re upgrading your existing mattress or purchased a trundle frame only, make sure you’re buying the perfect trundle bed mattress. It will need to be thin enough to fit under the main bed frame but also thick enough to offer a comfortable night’s sleep. Usually, the mattress should be between 6 and 8 inches in height. If you use it regularly, remember to also allow some room for bedding in between the trundle mattress and the bottom of the bed frame. Remember, we’ve reviewed loads more trundle beds under each category. Simply click on the link below each of our winners. Also check out this video with some more style ideas.